As many of y'all know, October is Breast Cancer Awareness month. This is a month & cause that is dear to my family's heart as my sweet mother-in-law was diagnosed with this awful disease. 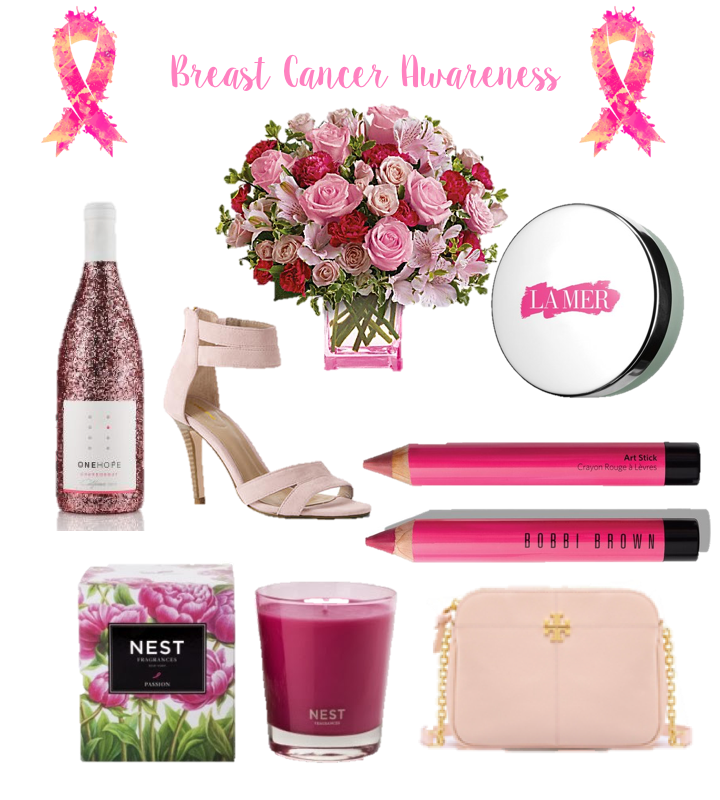 Each year around this time I like to pick out several companies & promote their items that give back to breast cancer awareness and research...enjoy my roundup & help us fight like a girl for a cure! First of all, this bottle is absolutely gorgeous & one that I would love to keep on my bar-cart or gift to a girl friend! Every two bottles purchased fund a clinical trial for one woman with breast cancer. This color is absolutely stunning & the strappy look is on trend. 15% of net online purchase price goes to the Breast Cancer Research Foundation. I think this gorgeous bouquet would be perfect to send to a friend or family member who are battling breast cancer or who just need a pick-me-up! 15% of the purchase price goes to fund the Breast Cancer Research Foundation. This small lip balm is super moisturizing and the perfect size for tucking into your purse or keeping on your desk to always have on hand. For every balm purchased, La Mer will donate $10 to the Breast Cancer Research Foundation. These can be used to fill in and line your lips & have long lasting color. For each set purchased, Bobbi Brown will donate $10 to the Breast Cancer Research Foundation. Nest candles are some of the best on the market with their long burn-time & delicious scent. This candle is also a gorgeous magenta-pink shade, perfect for your insta shots! I also want to add the link to the BCA reed diffuser for those that would rather have those than a candle! 10% of the retail price will be donated to the Breast Cancer Research Foundation. This is literally the perfect size cross-body bag (especially for all you college gals who need a small going out bag!) and the color is so sweet. I hope y'all found a product that you love & would love to purchase to help us find a cure for this disease which robs so many women of their health & their lives. what a great idea for a blog post and I love these picks! I hope that your MIL is doing okay! Love these products, beautiful for a beautiful cause. I have several family members who have been affected by breast cancer and I always look for products to support this cause. Love the champagne and the shoes! I love the strappy pink heels even though I don't wear pink! Good luck with this great cause. These products are so pretty! So important with breast cancer awerness! Oh I love the wine bottle! I am need to get a few and ship them to my friends! What a great post! I use to do a run every year for breast cancer and now that I've moved I need to find a new run for it. Thanks for bringing attention to this. So many people feel helpless in the cause and feel as though they cannot contribute, but that's not true. I'm putting together a team for a walk in DFW taking place next week so we can bring awareness. You're sharing products that donate to campaigns. There's such a wealth of knowledge out if people would grab it! Prayers for your MIL. So much pretty in pink! Loving the sparkling wine bottle! Ps prayers for your mother in law! Love the pink lip pencil! Great idea for a post. I'm sorry that you're MIL has had to deal with this disease. It is truly awful. I hope one day we will have a cure. I was surprised at how much the companies actually donate! I haven't been affected my breast cancer, but other cancers have run in my family so this is something I care deeply about. Really hope someday they can find a cure in the mean time I will always support breast cancer awareness and you have given us some great products. Thoughts for your mother in law. Thanks for taking the time to talk about a topic like this! This post just warmed my heart. My Nana has balled Brest cancer twice and was such a fighter. I feel so lucky that she made it though and is here today. In my family all the women are given a pink crystal bracelet as a reminder how strong our Nana is and how grateful we are to have her. to date is is my favourite bracelet my heart warms up every time I see it. This is such an informative post! I love knowing their are so many was to give to the cause! This is such an incredible cause, and I'm so happy that there are so many companies out there that want to help! My best friend's mom is a survivor, so this one is pretty dear to me! I had no idea there were so many products that support breast cancer. I need to stock up and support a great cause! Thanks for this post! I love how supporting companies that give back and support a good cause. My great aunt is battling breast cancer, but has her last treatment today! Sending prayers and thoughts to your mother in law! I had no idea so many products benefitted the Breast Cancer awareness cause! Hugs and prayers for you and your family. Great ideas for a post. All of the efforts to bring awareness to BC are so worth it. Warm healing thoughts to all. Excellent choices! I love pink, but even better if the proceeds go to breast cancer research! Isn't One Hope amazing?! I LOVE them! Their chardonnay is killer - and such, such great causes! Excellent idea to spread awareness! Loving all the pink products to help a wonderful cause. These are all great picks! Pink is my favorite color and I love supporting Breast Cancer Awareness so October is always my favorite! That wine bottle has my name written all over it! Love how you're spreading awareness and helping to raise money :)Thoughts go out to you and your loved ones. My thoughts and prayers go out to you, your family, and your mother in law. Thanks for taking the time to round up these awesome companies that give back! I love thsee and the message behind them!They would make great gifts too Sending prayers to your MIL. I love this post. Prayers to you and your family! Praying for your MIL! Too many people in my family have suffered with this disease.. I totally support the fight to find a cure! That pink glitter wine bottle looks beautiful! Need to pick one up for my bar cart!